This update fixes a whole swath of small issues, and even a few larger ones. The full change list is at the forum. As usual, you can either download it over at the forum, or use the built-in updater. 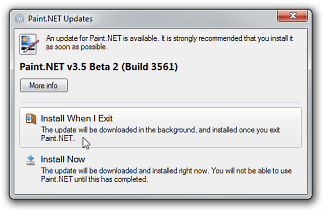 For those new to Paint.NET v3.5 with Beta 1, this is your first chance to try out the new background updater – you can have it download the update without sitting around and waiting for it as a foreground task! Of note, there’s a new option in the Window menu called “Glass Dialog Buttons.” I really like the glass footers for dialogs and don’t want to give them up, but just enough people have expressed a strong dislike that I decided to make it an option. I was trying to update Paint.NET but ran into a problem. I used the auto updater and an other install program was running in the background. When the Paint.NET installer tries to install the newer version it detects the other install program and aborts the process. It already deleted the older Paint.NET version, so I and up with no Paint.NET on my system. I reckon this is not what is supposed to do? I too ran into an issue (well most of the .NET auto-updatable programs I use at work have the problem). Is the auto-updater supposed to work behind a corporate proxy? The “Search for updates” box fails with a HTTP 407 error (ProxyAuthenticationRequired) and, btw it didn’t ask me for any credentials. I don’t know how they manage to do this, but Reflector is correctly updating (it used not to) and doesn’t ask either for credentials. I’m really looking forward for the final release of Paint.NET… Really nice job, Rick. You give a good name for the Free Software. System.DllNotFoundException: Die DLL “Native.x86\PaintDotNet.Native.x86.dll”: Das angegebene Modul wurde nicht gefunden. (Ausnahme von HRESULT: 0x8007007E) kann nicht geladen werden. I updated from Paint 3.5 beta 1 to beta 2 (this last release). I tried to paste a screenshot (2 megabyte), and than wanted to use the toolbar: it gives a very very slow reaction. Anybody recognizes this problem? Rick this occured to me while testing out the “glassified” image area. Why is it that I have to first switch to an image to close it? Is this by design, or is it a bug? What would be cool if you could have the fonts organized by catagory… Like “serifs”, “dingbats”, “gothic”, “effects”, etc? Or way that we the user can organize them? Ian, I don’t agree. Paint.NET is not a font organizer. I’m definitely a fan of glass anywhere it can be appropriately used. Thanks for leaving it in! Can you please register Paint.NET as a “Default Program” in Windows 7/Vista along with all its natively supported file types? Actually, never mind the “less restricitve license” bit. I was just confused in memory by the “royalty-free license” option.